Conform to EN166 1. F EN 170 and EN 172. Sleek sports metal provides the wearer with optimal protection. Panoramic vision with integrated side shields. Soft adjustable nose pads and Bolle 'Tip Grip' system for improved fit. Platinum coated anti mist and anti scratch lens. 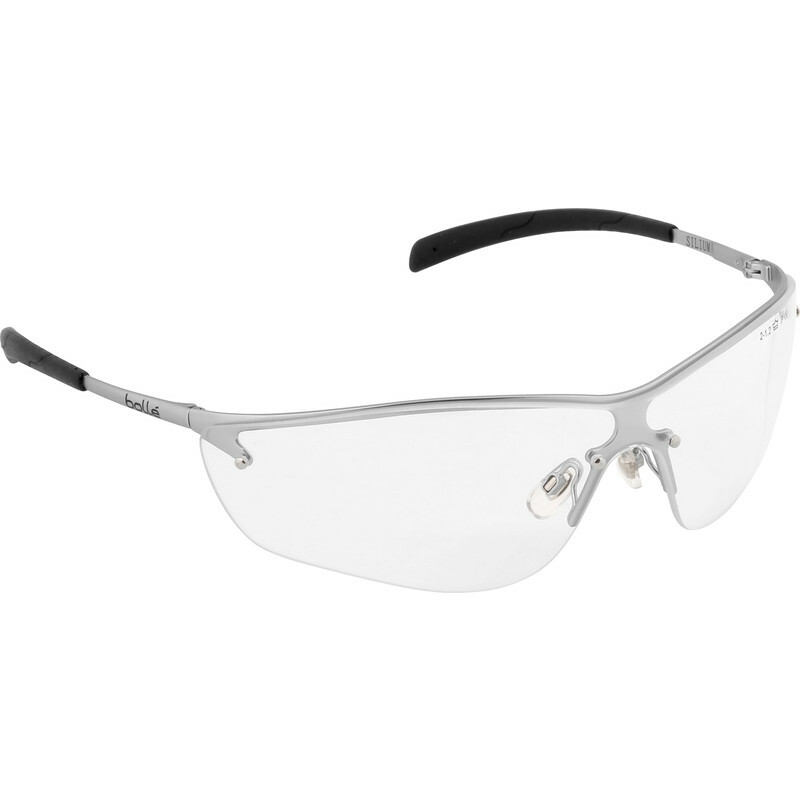 Bolle Silium Safety Glasses Clear is rated 4.8 out of 5 by 8. Rated 5 out of 5 by Bob 24 from Versatile Bolle Safety Sun Glasses I wear contact lenses and wanted some lightweight sun glasses for skiing and biking. During a week's skiing in the French Alps with brilliant sunshine every day, these sun glasses were excellent with a superb, unobstructed field of view and a pleasant grey tint. They fit easily under my ski helmet and as a bonus my mate, who is an optometrist, reckoned they are optically correct (no distortion). Haven't tried them with my motorbike helmet yet, but very pleased with purchase. Rated 5 out of 5 by xyzDave from Don't seem to mist up Really pleased - did a lot of heavy work wearing these and they didn't mist up at all. Not sure if the coating will wear off over time, but so far they have been great! Comfortable too. Rated 5 out of 5 by Votethecouncilout from What a bargain! These are quality safety glasses made by Bollé. Use them in the garden when using a strimmer. Also not too dark for driving. Rated 5 out of 5 by Mr big G from Smokey Wow fantastic comfortable and secure on the head good looking. Rated 5 out of 5 by Brucek from Good vaalue I bought one pair well impressed so bought a second pair. Rated 3 out of 5 by richp from poor fitting Bought these as work outside. Smoke lens work well but lens dig into face. Gave up wearing them and got different make that fitted me better.